When it comes to overcoming challenges and managing complexity, most companies look to their enterprise software. 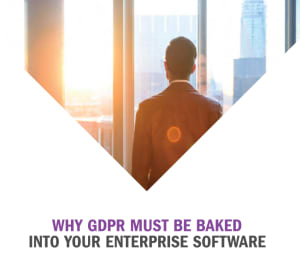 But most enterprise software applications do not yet have features that deal with the European Union’s new General Data Protection Regulation (GDPR). There are standalone point solutions that address GDPR. But can a point solution address the challenge given that protected data likely exists in many different ways across a business application, like enterprise resource planning (ERP) software? What are the different places protected data may be housed—beyond customer relationship management (CRM) software or the customer master in an ERP or field service management application? Can a company effectively deal with GDPR compliance with a point solution integrated with their enterprise software? What GDPR means for companies in the US.